Try your luck, if you make us a buck! The Stick It On Lucky Dip Machine primed, locked and loaded for its first winner! 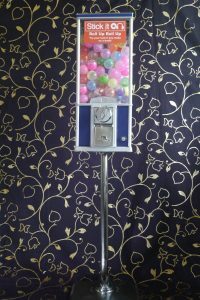 The idea is very simple – anyone who successfully sells in a Stick It On event will get a chance to pop a ball from Stick It On’s very own ‘Lucky Dip Machine’. Inside each ball, there is a raffle ticket that corresponds to a prize we will get for you to say thanks for securing us a gig. We hope we’ve found a fun innovative way to keep ourselves in your mind’s eye and offer some tasty gifts (if we don’t say so ourselves) for any work you can send our way. Refer a friend, relative, colleague or company to Stick It On. Hey, presto! You’re in the live draw broadcast on Facebook Live. The number that drops out of our lucky dip machine corresponds to a prize (see below for prize list). 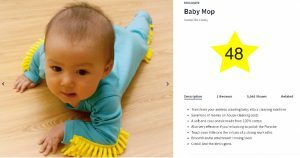 Put your baby to work whilst you put your feet up and enjoy a cuppa with this ingenious baby mop outfit. Adorable and practical, a clear winner in our eyes! Keep an eye on our Facebook page for more information and for live draws where one of the Stick It On team will live stream picking out a lucky number. Click here to download our list of prizes and see what’s up for grabs, from solar system lollipops to 2 flights to Barcelona we’ve got you covered. Good luck from the Stick It On team. 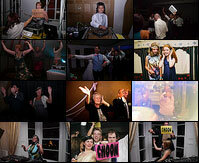 What makes a good office party?